How Do I Start a Mesquite Wood BBQ? Foods such as pork, poultry, fish and beef are commonly smoke using cedar chips. 2 How Do I Start a Mesquite Wood BBQ? Smoking is a cooking technique that uses low heat combined with certain types of wood to produce tender, highly-flavored foods. There are many different types of wood you can use when smoking food, including hickory, mesquite, oak, apple, alder and cedar, all of which provide different flavors. 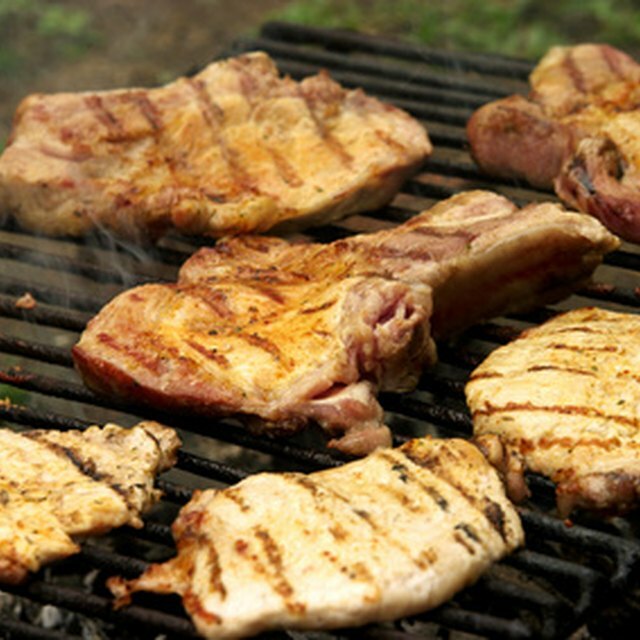 The most common types of foods used in smoking are meats such as beef, lamb, pork, poultry and fish. You can smoke foods using a charcoal grill, gas grill or a grill that is a smoker. Fill the bottom of a foil pan with cedar chips, and add one inch of water. Soak the cedar chips for around 60 minutes. Fire up the grill. If you're using charcoal, let the coals heat up for 30 to 45 minutes. If you're using a gas grill, let the grill heat up for 10 minutes or so. Drain the water from the cedar chips. If you're using a charcoal grill, disperse the cedar chips within the hot coals using a pair of tongs. If you're using a gas grill, place the drained cedar chips back in the foil pan. Set the foil pan directly on the grill rack. If your grill has a smoker, place the cedar chips directly inside the smoker. Be sure the heat is turned down to low--the optimum temperature when smoking foods is 225 to 250 degrees F.
Grease the grill grates with vegetable oil, and place your food directly on the grill. Close the lid of the grill, and open the vent to allow some smoke to escape. Only lift the grill lid up once to turn the meat because every time you lift the lid, you allow smoke to escape. Turn off the grill, add fresh herbs and spices to your food and allow the food to rest for 5 minutes with the grill lid up. Remove the food from the grill, and allow it to rest on a plate for another 5 to 10 minutes before serving. This will allow the juices to distribute throughout the food, providing a juicier and more tender bite. Let the foil pan cool down for at least an hour, douse the cedar chips with water and discard the pan and the cedar chips.